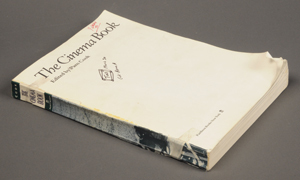 David Foster Wallace's copy of 'The Cinema Book.' Photo by Pete Smith. Approximately 200 books from David Foster Wallace’s library arrived at the Ransom Center with his papers. When the staff unpacked the collection to check its condition, we could see immediately that the library was not simply a supplement to the archive but an essential part of it. Wallace annotated many of the books heavily: he underlined passages, made extensive comments in the margins, and utilized the front and back inside covers for notes, vocabulary lists, brainstorms, and more. As a reader of Infinite Jest, one book in particular caught my eye: a battered paperback copy of Pam Cook’s edited volume The Cinema Book (New York: Pantheon, 1985). This reference work is heavily used: it lacks both its front and back cover, its spine is held on with two pieces of tape, and the exposed inside cover is inscribed “D. Wallace ’92,” four years before the publication of Infinite Jest. Infinite Jest is a book about many things, and the mesmerizing power of movies is one of its most dominant themes. One of the book’s central figures is the late James O. Incandenza, an auteur whose filmography has left an indelible mark upon all of the novel’s characters in one way or another. Early in the novel, the reader learns of the extent of his importance in endnote 24. Endnote 24 comprises Incandenza’s entire filmography, which fills eight pages in tiny print. The reader discovers here that it is essential to actually read Wallace’s footnotes (spoiler alert), because only in this endnote do we learn that Infinite Jest is the title of an Incandenza film. Traces of The Cinema Book may be found throughout Wallace’s novel, beginning with the basic format of the filmography itself: notably, Wallace penned a bracket around the “Special Note” at the front of The Cinema Book, in which Cook outlines the format her citations will take, and Wallace’s citations of Incandenza’s films resemble these closely. Wallace may also have gathered much film knowledge from this volume. The Incandenza filmography is a virtuosic pastiche of film history, technology, and vocabulary. We are told that Incandenza made every kind of film: “industrial, documentary, conceptual, advertorial, technical, parodic, dramatic noncommercial, nondramatic (‘anti-confluential’) noncommercial, nondramatic commercial, and dramatic commercial works” (985). Wallace annotated passages throughout The Cinema Book, with the exception of two theoretical chapters. He noted concrete information such as the names of actors, directors, production companies, film journals, and significant events in film history. His annotations show his interest in a wide range of terms and themes covered in the volume, with particular interest in sections on the idea of the auteur, the technology of deep focus cinematography, new wave cinema, the Hollywood star system, and most film genres (with the notable exception of the “the gangster/crime film,” the only genre lacking any Wallace annotations). Finally, my favorite set of annotations surround the section on the genre of the musical, written by Andy Medhurst. Medhurst spends a considerable amount of time discussing this genre’s dominant theme: entertainment. Wallace has underlined passages discussing the ways in which this genre taps into viewers’ nostalgia and their desire to experience a “vision of human liberation” in a utopian entertainment experience. Wallace has penned “ENTERTAINMENT” at the top of the page and circled the page number (107). This word is central to the project of Infinite Jest, and it is enlightening to read one of the sources from which its meanings in the novel likely derive. Unpacking Wallace’s library was a once-in-a-lifetime experience for this reader; once this and his other books have been cataloged, I look forward to seeing what insights scholars will derive from the hundreds of books and thousands of annotations beyond the few I have noted here. This is so exciting. I can’t wait to get a look! While this is great and all, I would rather have the man alive and not see his notes than to see his notes and not have him around for us to treasure. Thanks for the post, but this just made me sad about his death all over again. This is very very exciting. I hope to see more of this released soon. Christian in NYC – I agree, but rathering he was alive is irrelevant. In response to Roy: Touché! This is great news about the collection. What a loony video–a real treasure–very funny to hear DFW discuss the importance of economy in style. I wonder what he was up to?